DOC has recently become the de facto standard which competing products must support to interoperate in an office environment due to the popularity of Microsoft Word. The bad thing is that the various versions of Word differ from one another. That means formatting created in newer versions does not always survive when viewed in older versions of the program, nearly always because that capability does not exist in the previous version. The good thing is its interoperability achieved through reverse engineering since documentation of the file format, while available to partners, is not openly available. Like other Microsoft Office applications, Word is highly customised using a built-in macro language (originally WordBasic, but changed to Visual Basic for Applications as of Word 97). However, the Melissa worm showed that this capability can also be used to embed viruses in documents. This is just another reason to install a firewall and anti-virus software. Doc is widely supported but sometimes you need to convert Doc files to PDF, XLS, HTML, or images. 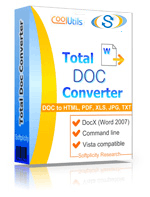 Try Total Doc Converter from CoolUtils. It's fast, reliable and very flexible.